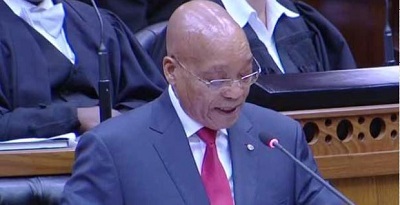 The Speaker of the National Assembly, The Chairperson of the National Council of Provinces (NCOP), Deputy speaker of the National Assembly and Deputy Chairperson of the NCOP, Deputy President Cyril Ramaphosa, Former President Thabo Mbeki, Chief Justice Mogoeng Mogoeng and all esteemed members of the judiciary, Ministers and Deputy Ministers, Premiers and speakers of provincial legislatures, Chairperson of the South African Local Government Association, the heads of Chapter 9 institutions, Chairperson of the National House of Traditional Leaders, The President of the Muslim Judicial Council and all leaders of faith-based organisations, The former speaker of the National Assembly, Dr Frene Ginwala, Veterans of the Struggle for liberation, Members of the diplomatic corps, Fellow South Africans, Good evening, sanibonani, molweni, dumelang, goeie naand, lotjhani, riperile, ndimadekwana. We also fondly remember Mama Africa, Miriam Makeba, who made history when she addressed the United Nations in 1963,appealing for action against the apartheid regime. Compatriots, in this 23rd year of our freedom, our mission remains the quest for a united, democratic, non-sexist, non-racial and prosperous South Africa. While the global economic environment remains uncertain, indications are that we have entered a period of recovery. We anticipate an economic growth rate of 1.3% in 2017 following an estimated 0.5% in 2016. However, the economy is still not growing fast enough to create the jobs that we need. There are some of our people, including youth, who have not worked for years. It is for this reason that we decided to focus on a few key areas packaged as the Nine-Point Plan to reignite growth so that the economy can create the much-needed jobs. The focus areas include industrialisation, mining and beneficiation, agriculture and agro-processing, energy, small, medium and micro enterprises (SMMEs), managing workplace conflict, attracting investments, growing the oceans economy and tourism. We also added cross-cutting areas such as science and technology, water and sanitation Infrastructure, transport infrastructure and broadband roll-out. I would like to provide a report back on the work done in some of these areas in the past year. The interaction that we started last year between government, business and labour, known as the CEO Initiative, has been most helpful. We were able to address some domestic challenges, together. We successfully avoided credit ratings downgrades, which would have had a significant impact on our economy. Our labour-market environment is also showing signs of stability, due to cooperation by social partners. The manner in which parties conducted and carried themselves during the wage negotiations in the platinum sector in particular, must be applauded. Unity in action was also demonstrated again this week with the conclusion of the agreement on the national minimum wage and on measures to stabilise labour relations. This follows a call I made in the State of the Nation Address on 14 June 2014. Compatriots, the extension of basic services to the people continued in the past year as we pursued a better life for all. To date, nearly seven million households have been connected to the grid and now have electricity. The successful execution of the Eskom’s Build and Maintenance programmes helped to ensure stability and an end to load shedding. Work is continuing to ensure energy security. Renewable energy forms an important part of our energy mix, which also includes electricity generation from gas, nuclear, solar, wind, hydro and coal. Government is committed to the overall Independent Power Producer Programme and we are expanding the programme to other sources of energy including coal and gas, in addition to renewable energy. Eskom will sign the outstanding power purchase agreements for renewable energy in line with the procured rounds. Government is working hard to ensure reliable bulk water supply in the various areas of the country to support economic growth while increasing access to vulnerable and rural municipalities. In an effort to curb high water losses, which in some municipalities far exceed the national average, which is currently at 37%; about 10 000 unemployed youth are being trained as plumbers, artisans and water agents. More will be recruited this year to reach the total of 15 000. We call upon municipalities to support the War on Leaks programme. We continue to build modern schools, replacing mud structures and other inappropriate buildings through the Accelerated Schools Infrastructure Delivery Initiative. This gives our children dignity. A total of 173 inappropriate structures have been eradicated since 2011. In total, 895 new schools now provide a conducive learning environment for our children. Compatriots, President Oliver Reginald Tambo was a maths and science teacher. Government will thus prioritise maths and science more than ever before this year, in his memory. We are encouraged by recent international test results. The results in the Trends in International Mathematics and Science Study and the Southern and East African Consortium for Monitoring Educational Quality show that the performance of South African learners is improving. Among the participating countries, South Africa has shown the largest improvement of 87 points in mathematics and 90 points in science. This is very encouraging, as we do not want our children to be left behind. Our investment in science and technology is yielding results. Since South Africa, supported by its eight African partners, won the bid to host the Square Kilometre Array (SKA) telescope, significant progress has been made in building this mega science project and reaping its benefits. Together with its precursor, the MeerKAT telescope, the SKA project continues to make important contributions to socio-economic development in South Africa. Working closely with the industry, the Department of Science and Technology is implementing a technology localisation strategy. This has ensured that the R2 billion MeerKAT telescope is constructed with 75% local content. This has led to job creation in the Northern Cape and diversification of the economy through the creation of artisan and maintenance jobs, and the promotion of science as a career of choice. The Moloto Road and a railway line are currently under construction with the purpose of ensuring the safety of road users and also bring to an end, the accidents that claim many lives). During 2016, South Africa also signed a cooperation agreement with the People’s Republic of China (PRC) to build the Moloto Rail Development Corridor. In 2014, we launched the operation Phakisa Big Fast Results Methodology in the ocean economy, health, education and mining sectors. The purpose was to find a few key projects where we could unlock growth in implementing the NDP. All projects are proceeding well. The South African Navy also participates in the Operation Phakisa project and is preparing to host the government garage concept for all state-owned vessels in Simon’s Town, including the maintenance and repair of government-owned vessels, through the newly established South African Navy/ARMSCOR/Denel partnership. We had identified tourism as a key job driver. We are thus pleased that our tourist arrival numbers for the period January to November 2016 increased to nine million, an increase of just over a million arrivals from 2015. This represents a 13% growth in tourist arrivals. Government runs effective poverty alleviation programmes such as the Expanded Public Works Programme (EPWP). In addition, social grants now reach close to 17 million people, mainly older persons and children. Many families would not be able to put food on the table if it were not for social grants. The EPWP has since 2014, created more than two million work opportunities towards the attainment of the target of six million work opportunities by the end of March 2019. Of the work opportunities created, more than a million have been taken up by the youth. During 2015/2016, more than 61 000 work opportunities were created through environmental programmes such as Working for Water, Working for Wetlands, Working on Fire and Working for Ecosystems. More than 60% of the beneficiaries were young people. Government, working with society is fighting social ills that are tearing communities apart, such as drugs and substance abuse. From Soshanguve to Rosettenville or KwaMashu to the Cape Flats, communities are in difficulty because of drugs. Other than law enforcement, the provision of treatment and prevention services is also critical. The Department of Social Development is building new public treatment centres in provinces where there are no such facilities, in the Northern Cape, North West, Limpopo, Free State and the Eastern Cape. Working together we will save our youth from drugs. On health matters, the National Health Insurance (NHI) is our flagship project that is aimed at moving South Africa towards Universal Health Coverage. The NHI will be implemented in a 14- year period in three phases. We are in the midst of the first phase, which is the preparatory phase, which started in 2012. Compatriots, we are deeply distressed by the death of so many psychiatric patients in Gauteng. Mentally ill patients are some of the most vulnerable members of society, who need protection from the State itself and society as a whole. I have instructed the Minister of Health to ensure that the Health Ombudsperson’s recommendations are wholly and speedily implemented without any reservations. We welcome the recommendation of the Health Ombudsperson that there is an urgent need to review the National Health Act, 2003 (Act 61 of 2003) and the Mental Health Care Act, 2002 (Act 17 of 2002) with a view that certain powers and functions revert to the Minister of Health. Once more, we extend our heartfelt condolences to all families and relatives of the deceased. Government will provide support so that families do not face this burden alone. The Premier of Gauteng and the Minister of Health have already provided this assurance. A lot more work has been done in the past year in implementing the Nine-Point Plan and all our programmes. Ministers will report further on the programmes during the budget votes. Honourable members, I would now like to speak on our priorities for the year ahead. Twenty-two years into our freedom and democracy, the majority of black people are still economically disempowered. They are dissatisfied with the economic gains from liberation. The gap between the annual average household incomes of Africanheaded households and their white counterparts remains shockingly huge. White households earn at least five times more than black households, according to Statistics SA. The situation with regards to the ownership of the economy also mirrors that of household incomes. Only 10% of the top 100 companies on the Johannesburg Stock Exchange are owned by black South Africans, directly achieved principally, through the black empowerment codes, according to the National Empowerment Fund. The pace of transformation in the workplace, the implementation of affirmative action policies as required by the Employment Equity Act, 1998 (Act 55 of 1998) also remains very slow. In terms of the 2015/16 information submitted to the Employment Equity Commission, the representation of whites at top management level amounted to 72% while African representation was at 10%. The representation of coloureds stood at 4.5% and Indians at 8.7%. The report further provides that white South Africans, in particular males, are afforded higher levels of recruitment, promotion and training opportunities as compared to the designated groups. At the level of gender at senior management level, males remain dominant at 67.6% and females at 32.4%. The skewed nature of ownership and leadership patterns needs to be corrected. There can be no sustainability in any economy if the majority is excluded in this manner. In my discussions with the business community, they accepted these transformation imperatives. Today we are starting a new chapter of radical socio-economic transformation. We are saying that we should move beyond words, to practical programmes. The State will play a role in the economy to drive that transformation. In this regard, government will utilise to the maximum, the strategic levers that are available to the State. This includes legislation, regulations, licensing, budget and procurement as well as Broad-based Black Economic Empowerment charters to influence the behaviour of the private sector and drive transformation. The State spends R500 billion a year buying goods and services. Added to this is the R900 billion infrastructure budget. Those budgets must be used to achieve economic transformation. As a start, the new regulations making it compulsory for big contractors to subcontract 30% of business to black-owned enterprises have been finalised and were gazetted on 20 January. Through such regulations and programmes, government will be able to use the State buying power to empower small enterprises, rural and township enterprises, designated groups and to promote local industrial development. Two key challenges we face are the high levels of concentration in the economy and the collusion and cartels, which squeeze out small players and hamper the entry of young entrepreneurs and black industrialists. The competition authorities have done excellent work to uncover the cartels and punish them for breaking the law. Last year I signed into law, a provision to criminalise the cartels and collusion and it came into effect on 1 May. It carries jail sentences of up to 10 years. We are now stepping up our actions to deal with the other challenge, namely economic concentration, where a small grouping controls most of a market. During this year, the Department of Economic Development will bring legislation to Cabinet that will seek to amend the Competition Act, 1998 (Act 89 of 1998). It will, among others, address the need to have a more inclusive economy and to de-concentrate the high levels of ownership and control we see in many sectors. We will then table the legislation for consideration by Parliament. In this way, we seek to open up the economy to new players, give black South Africans opportunities in the economy and indeed help to make the economy more dynamic, competitive and inclusive. This is our vision of radical economic transformation. Compatriots, Government is actively involved in the property sector, having provided more than four million houses since 1994. This sector in our country is valued at approximately R7 trillion, with the subsidised sector being valued at R1.5 trillion. However, less than 5% of the sector is owned or managed by black people and Africans in particular. A draft Property Practitioners Bill will be published by the Department of Human Settlements for public comment with the purpose of establishing a more inclusive, representative sector, towards radical economic transformation. Among key priorities this year, government will also address the increasing delays and backlogs in registration and issuing of title deeds to beneficiaries of housing projects funded by the capital subsidy. Compatriots, We reiterate that radical economic transformation should mean moving beyond share ownership schemes only. We would like to see black people involved directly in business, owning factories. The development of the Black Industrialists Programme is thus critical. The programme has from inception supported more than 22 entrepreneurs. Government has further opportunities in the property maintenance projects of the Department of Public Works. The department will invest approximately R100 million this year on critical capital and maintenance programmes to modernise harbours. They will also continue generating revenue from letting state-owned harbours and coastline properties, which will benefit black-owned SMMEs. Government will also continue to pursue policies that seek to broaden the participation of black people and SMMEs, including those owned by women and the youth, in the information and communications technology sector. We assure the youth that the lowering of the cost of data is uppermost in our policies and plans. Compatriots, Mining has always been the backbone of our economy and an important foreign exchange earner. We welcome the recovery in commodity prices, which has resulted in an upswing in mining output. This augurs well for the industry. The Mining Charter is currently being reviewed. The charter seeks to recognise the internationally accepted right of the State to exercise sovereignty over all the mineral and petroleum resources within the republic. It is also aimed at helping the country to de-racialis the ownership of the mining industry. This will help to ensure the sustainability of this industry. We trust that discussions between government and business on the charter will yield results so that the process can be finalised. The Minerals and Petroleum Resources Development Amendment Bill was sent back to Parliament so that issues relating to the public consultation process undertaken by provincial legislatures can be addressed. We trust that it shall be processed and returned for finalisation without much delay so that the concerns relating to uncertainty raised by business can be resolved. Government continues to work with other stakeholders to combat illegal mining to save lives and to prevent the trafficking of precious metals and diamonds. We also continue to place great emphasis on the health and safety of mineworkers, which is so crucial to the sustainability of the mining sector. Working with the mining companies we can ensure that lives are protected at all times. The tragic accident that occurred at Lily Mine in Mpumalanga earlier in 2016 is the first of its kind that we have experienced since the dawn of democracy. The families are going through immense pain and frustration. Compatriots, It will be difficult if not impossible, to achieve true reconciliation until the land question is resolved. Only eight million hectares of arable land have been transferred to black people, which is only 9.8% of the 82 million hectares of arable land in South Africa. There has also been a 19% decline in households involved in agriculture from 2.9 million in 2011 to 2.3 million households in 2016. We had stated our intention of using the Expropriation Act, 1975 (Act 63 of 1975) to pursue land reform and land redistribution, in line with the Constitution. I have now decided to refer the Bill back to Parliament for reconsideration on the basis that it might not pass constitutional master. This is due to inadequate public participation during its processing. We trust that Parliament will be able to move with speed in meeting the requirements so that the law can be finalised to effect transformation. The reopening of land claims is also still on hold because the Restitution of Land Rights Amendment Act, 2014 (Act 15 of 2014) was declared invalid by the Constitutional Court. 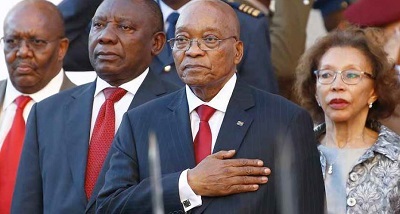 The Constitutional Court found that the public consultation process facilitated by the NCOP and some provincial legislatures, did not meet the standard set in the Constitution. Going forward, government will continue to implement other programmes such as the Strengthening the Relative Rights of People Working the Land programme, also known as the 50-50 programme. In this programme, the farm workers join together into a legal entity and together with the farm owner, a new company is established and the workers and the owner become joint owners. To date, 13 proposals have already been approved, benefiting 921 farm dweller households at a value of R631 million. We applaud farmers and farm workers for this innovation. Most importantly, we appeal to land claimants to accept land instead of financial compensation. Over 90% of claims are currently settled through financial compensation, which does not help the process at all. It perpetuates dispossession. It also undermines economic empowerment. Government has committed itself to support black smallholder farmers. I received a memorandum from the African Farmers Association of South Africa who says that the year 2017 must be the year of the commercialisation of the black smallholder farmers. Indeed, government will implement a commercialisation support programme for 450 black smallholder farmers. We encourage more women to consider farming. I have, as a special guest today, the 2016 Female Farmer of the Year, Vanecia Janse from Koukamma municipality in the Eastern Cape. Compatriots, Our farmers went through a difficult period last year because of the drought. To date, an estimated amount of R2.5 billion was made available for the provision of livestock feed, water infrastructure, drilling, equipping and refurbishment of boreholes, auction sales and other interventions. Furthermore, the Industrial Development Corporation and the Land Bank availed funding of about R500 million to distressed farmers to manage their credit facilities and support with soft loans. Compatriots, President Oliver Reginald Tambo was a champion of women’s rights. We will continue to mainstream the empowerment of women in all government programmes. Government will continue to prioritise women’s access to economic opportunities and, in particular, to business financing and credit. This is the freedom that heroines of the Struggle such as the late Dora Tamana of Gugulethu, here in Cape Town, fought for. I am pleased to have her son, Mongezi Tamana, as a guest today. Compatriots, In December 2015, university students voiced their concerns about the cost of higher education. They correctly pointed out that accumulated debt and fast rising fees were making it harder and harder for those who come from less-privileged households to enter and stay within the education system until they complete their studies. It is for this reason that when university students expressed genuine concerns about being excluded from universities, our caring government responded appropriately by taking over the responsibility to pay the fee increase for the 2016 academic year. Government also settled all debt owed by the National Student Financial Aid Scheme (NSFAS) students and extended the coverage to larger numbers of students than ever before. As a result, NSFAS students who study at some universities that charge higher fees end up accumulating debt. Our governmentinitiated processes are already looking at this issue too. Honourable members and fellow South Africans, students and their parents should understand that the needs for services such as water, sanitation, early childhood development and good public transport also have to be addressed, alongside access to quality higher education and training. But our commitment to finding sustainable solutions to the funding of the social wage in general, and education, in particular, is unwavering. As the processes that we have set in motion draw to a close, such as the Heher Commission, the Ministerial Task Team, broader engagements with students, university and TVET leadership and civil society, we will find resources to give expression to our policies. I invite all stakeholders to participate in the processes that are underway so that no view is not heard. No great idea should be excluded. As soon as the broadest sections of our society agree on what to do, our government will take steps to reprioritise resources to implement it on a phased basis. Let us engage to identify the most pressing needs and allocate our limited resources accordingly. Let us build our self-reliance and move forward in the spirit of unity. Compatriots, The fight against crime is an apex priority. The police will increase visible policing, building on the successful pattern of deployments utilised during the Safer Festive Season Campaign. They will also utilise certain specialised capabilities, such as the tactical response teams and national intervention units, to assist in addressing problematic high-crime areas. We received a message from Soshanguve last week that crime is rife in Block L and that hijackings and robberies are high. It is such communities that need to build stronger partnerships with the police to ensure that criminals do not prey on residents. Other measures to fight crime nationally will include the establishment of specialised units, focusing on drug-related crime, taxi violence and firearms and the enhanced utilisation of investigative aids such as forensic leads.The police will also enhance the utilisation of the DNA database in the identification of suspects. We urge the public to work with the police to ensure safer communities. Compatriots, we welcome the decline in rhino poaching incidents since October 2015, which is for the first time in a decade. This arises from intensive joint operations by law-enforcement agencies. Compatriots, one of the strategies of fighting crime is to ensure that those who are released from prison do not commit crime again. The Department of Correctional Services continues to work hard to turn prisons into correctional centres through offering various services. As a result, compliance levels with parole and probation conditions have improved to reach a historic mark of 98%. The country has also made good progress in reducing the numbers of children in correctional centres. Compatriots, the promotion of access to justice was given added meaning last year when the High Court Division in Limpopo was opened in November. The Mpumalanga High Court will be completed during this financial year. The coming into operation of these two high courts means that we have now realised the goal of a high court in every province of the country. Compatriots, the fight against corruption continues. Within the National Prosecuting Authority, the Asset Forfeiture Unit completed 389 forfeiture cases to the value of R349 million. They obtained 326 freezing orders to the value of R779 million. Compatriots, Oliver Tambo set the tone for the country’s foreign policy as early as 1977 when addressing the first Congress of the Angolan ruling party MPLA that: “We seek to live in peace with our neighbours and the peoples of the world in conditions of equality, mutual respect and equal advantage”. South Africa is honoured to chair the Southern African Development Community (SADC) starting from August 2017. We will utilise our tenure to fast track the implementation of the SADC Industrial Strategy. We are accelerating the integration agenda through the implementation of SADC-COMESA-East African Community Free Trade Area. We will continue with our involvement in our mediation efforts, peacekeeping operations, and peace-making initiatives in Lesotho, Democratic Republic of Congo, Burundi, Mozambique, South Sudan, Somalia and Libya. The South African National Defence Force represents the country well in the peacekeeping missions. Furthermore, trade with our traditional partners in the west remains a significant contributor to our economy. We will continue to partner with the United States and work together on issues of mutual interest such as the full renewal of African Growth and Opportunity Act. We value our relationship with the PRC. China is one of South Africa’s most important and key strategic partners. We recognise the PRC ‘as the sole government and authority representing the whole of China’. South Africa reiterates its position and commitment to the ‘One China Policy’ and we consider Taiwan as an integral part of the PRC. At continental partnership level, the Joint Africa-European Union (EU) Strategy remains an important long-term framework for continued cooperation. The Economic Partnership agreement with the EU came into force in September 2016, thus providing new market access opportunities for South African products. Almost all South African products, about 99% will have preferential market access in the EU. About 96% of the products will enter the EU market without being subjected to customs duties or quantitative restrictions. The Southern African Customs Union Mercosur Preferential Trade Agreement has also entered into force, providing preferential access to over 1 000 tariff lines. This is an agreement that promotes South-South trade. Our cooperative partnerships with other regions are bearing fruits. The BRICS New Development Bank has recorded encouraging progress. We welcome the Goa BRICS Heads of State and Government decision to establish the BRICS Rating Agency so that we can assist one another in assessing our economic paths. We are also pleased with agreements with our BRICS partners in the field of agriculture. We will implement off take agreements on the export of pulses, mangos and pork to India. We will also export 20 000 tons of beef to China per year for a period of 10 years. We will continue to pursue the reform of the international system because the current configuration undermines the ability of developing countries to contribute and benefit meaningfully. This year marks the 50th anniversary of the occupation of Palestine. The expansion of Israeli settlements undermines global efforts aimed at realising the two state solution and the Oslo accord. We wish to reiterate our support for the Palestinian course. Similarly, we hope that the readmission of Morocco to the African Union should serve as a catalyst to resolve the Western Sahara issue. Compatriots, The Constitution accords equal rights and dignity to all South Africans. The United Nations proclaimed 13 June as International Albinism Awareness Day. We should use this day to raise awareness and eliminate the discrimination or harm that compatriots with albinism are subjected to in some areas. We also emphasise that people with albinism are also human beings like any other human being. Abusive behaviour against them should stop. The myth about albinism should also come to an end. I have the pleasure to introduce Ms Nomasonto Mazibuko, the executive director of the Albinism Society of South Africa, one of my special guests. The sports fraternity tragically lost one of its favourite sons, Joost van der Westhuizen earlier this week. The music industry has lost popular gospel musicians recently, Sifiso Ncwane and Lundi Tyamara, as well as maskandi musician, Nganeziyamfisa. We extend our condolences on the loss of these public figures who have contributed to the country’s sports and arts. Compatriots, Let us unite in driving radical economic transformation for the good of our country.